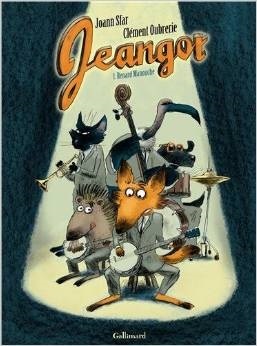 At first it seems to be a biography of the 1930s-‘40s gypsy fox musician Jeangot Renart, being written by his pal Niglaud the hedgehog in his old age. Niglaud was Jeangot’s lifelong pal and musical partner, so he knows all of the details. My name is Niglaud. I was born in 1910 in a willow cage, in a caravan wagon parked somewhere in Belgium, belonging to the Renart family. In Jeangot, Sfar focuses upon the life of gypsies in northwestern Europe between the two World Wars. The title of volume 1, Renard Manouche, is “The Gypsy Fox”. Niglaud explains that while most farmers raise chickens to eat, wandering gypsies prefer hedgehogs because they are easy to catch in the fields. What is different about him is that the Renarts raised caged hedgehogs in their travelling wagon. Niglaud was born at the same time as the Renarts’ own son, and he became the playmate of Jeangot, which is why he wasn’t eaten. Although the background and art are anthropomorphic, the dialogue is not very. In an early scene, Mrs. Renart is talking with another gypsy just after Jeangot’s birth. Narrator: Madame Renart brought into the world a boy that cried very loudly who she baptized ‘Jeangot’. Narrator: Then his father arrived, with his drunken pals. And they began to celebrate little Jeangot’s birth. The life of a European gypsy at the beginning of the 20th century was so exotic that it seemed made for funny-animal fantasy. The advantage of traveling homes is that they travel. We wandered a lot at that time because when we stayed too long in one place, the locals kicked us out. So we went to the South … to Italy … to Corsica … and when the World War broke out, we went to the Arabs [North Africa]. Where there was plenty of sun and nobody was trying to kill us. In November 1918, the war ended and the gypsies returned to Europe. By then Jeangot and Niglaud were old enough to leave home (an advantage of being gypsies), and they parleyed growing up as street musicians during the 20s into joining a jazz band in Paris as young adults around 1930. 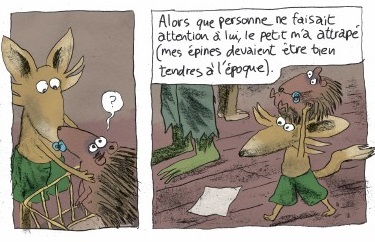 Jeangot is broadly similar to Robert Crumb’s Fritz the Cat, including the NSFW stuff like a rabbit whore. But about halfway through (please excuse the spoiler), Jeangot is suddenly almost killed and practically disappears from the book. From there on, it becomes obvious that Niglaud has been writing Jeangot’s biography. He pads it with his own autobiography – he is a much more interesting character once he stops living in Jeangot’s shadow – and the present, old-age Niglaud gets into violent arguments with his would-be publisher over whether his manuscript is saleable or not. By this point, Niglaud appears to be suffering from some old-age dementia, with his more recent memories of Jeangot clearly a fantasy. In fact, it is unclear whether Jeangot is alive or whether he died a long time ago. Does Niglaud really have a publisher, or is he like Charles Schulz’s Snoopy, convinced that he has written a best-seller that he really can’t interest any publisher in? This volume 1 ends with a note that the story will be continued in Music is for the Ears, but I can’t imagine where Sfar can take it next. Jeangot is certainly intriguing -- there is nothing else quite like it.